The Tank Assault badge was instituted in June 1943. 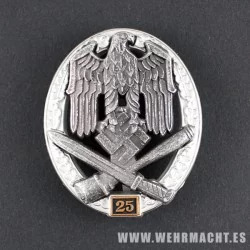 It was awarded to qualifying personel of the Heer and Waffen SS for participation in 100 separate combat engagements. Die struck in 3 pieces just like the original. The tank has the correct silvered finish and is neatly rivetted onto the gilt wreath. The gilt and black numbered plaque, is affixed to the bottom of the badge.